Declan Joseph Oliver Donnelly OBE (born 25 September 1975) is an English television presenter, producer and actor. He is best known for working alongside Anthony McPartlin as part of the presenting duo Ant & Dec. Donnelly came to prominence, alongside McPartlin, in the children's drama series Byker Grove, with both of the boys establishing successful careers as television presenters, in which they are most known for presenting SMTV Live (between 1998–2001), I'm a Celebrity...Get Me Out of Here! and Ant & Dec's Saturday Night Takeaway (since 2002), and Britain's Got Talent (since 2007). Donnelly is the child of Irish parents Alphonsus and Anne Donnelly, who originally resided in Desertmartin, County Londonderry, Northern Ireland, before migrating to Newcastle upon Tyne in the 1950s. He is among seven children the couple raised within the council estate of Cruddas Park, with Donnelly having three brothers – Martin, Eamonn and Dermott – and three sisters – Patricia, Moyra and Camalia. Donnelly's education took place first at St Michael's Roman Catholic Primary School, and later at the all-boys St Cuthbert's High School, with him receiving 8 GCSEs. Although he eventually moved towards a career in television, he originally considered becoming a Catholic priest but changed his mind upon seeing the students from the all-girls Sacred Heart Catholic High School. Donnelly's career in television began at the age of 12, when his father suggested that he audition for Byker Grove, a new children's television programme being created by CBBC in Newcastle upon Tyne that had been advertised in local newspapers. His success in this audition led to him securing the role of Duncan, whereupon he first met Anthony McPartlin. Although he was raised in an estate close to Donnelly, McPartlin had never met him until their involvement in the children's drama. The pair worked together on the show until their eventual departure in 1993, whereupon they began to bond as friends, both socially and professionally. After a short tenure in music, Donnelly and McPartlin furthered their careers in television by becoming the presenting duo Ant & Dec. The pair continued to work in children's television, fronting ITV's saturday morning children's programme SMTV Live. After leaving the programme in 2001, the pair branched out to front other shows, including game shows – Friends Like These, PokerFace and Push the Button – talent shows – Pop Idol, and Britain's Got Talent – and entertainment programmes – I'm a Celebrity... Get Me Out of Here!, and Ant & Dec's Saturday Night Takeaway. The pair continued to maintain acting careers, starring in a tribute to The Likely Lads in 2002, in the form of a remake of an episode from the show's sequel Whatever Happened to the Likely Lads?, entitled "No Hiding Place", and in 2006 film Alien Autopsy. In April 2009, Donnelly, along with McPartlin, achieved wide international exposure after interviewing Britain's Got Talent contestant Susan Boyle, whose audition would become the most-viewed YouTube video of 2009. Ant & Dec have their own production company Mitre Television where they produce their shows. On 22 July 2006, Donnelly was the best man for McPartlin's wedding to Lisa Armstrong. In August 2011, Donnelly attended his father's funeral, after Alphonsus died in hospital after losing his battle with cancer. Donnelly dated actress Clare Buckfield for ten years between 1993 and 2003, and television presenter Georgie Thompson from January 2009 until April 2011. On 13 November 2014, Donnelly became engaged to the duo's manager Ali Astall, with whom he had been in a relationship for over a year, with the marriage taking place at St Michael's Roman Catholic Church, Elswick, Tyne and Wear, on 1 August 2015. The ceremony was conducted by his brother, Father Dermott Donnelly, a Catholic priest, with McPartlin as his best man. On 1 September 2018, after announcing earlier in the year that the couple were expecting their first child, Donnelly's wife gave birth to a daughter, whom the couple revealed had been named as Isla Elizabeth Anne. Donnelly has stated that he is a practising Roman Catholic but does not publicly discuss religion or his family in depth. He is a supporter of the Labour Party. Donnelly and McPartlin are patrons of the charity Sunshine Fund. When their single 'Let's Get Ready to Rhumble' reached No.1 in 2012, Ant & Dec donated the single's success to the charity ChildLine. They also support the Text Santa appeal. Donnelly also supports the Diocese of Hexham and Newcastle's Youth Ministry Team, directed by one of his older brothers Fr Dermott Donnelly, Dean of St Mary's Cathedral in Newcastle. They opened the W4 Youth Centre in 2013. In 2007, Donnelly and McPartlin signed a 2½ year, £30 million contract with ITV. Donnelly was appointed an Officer of the Order of the British Empire (OBE) in the 2016 Birthday Honours for services to broadcasting and entertainment. An official I'm A Celebrity, Get Me Out Of Here! app launched on 9 November 2015. ^ "Declan Donnelly". Desert Island Discs. 29 December 2013. BBC Radio 4. Retrieved 18 January 2014. ^ Whelan, Dave (20 January 2014). "BGT's Declan Donnelly gets mum on the phone to savour Irish music in Belfast's Duke of York pub". The Belfast Telegraph. Belfast. Retrieved 6 December 2015. ^ a b "Dec leads mourners at dad's funeral". Evening Chronicle. 28 August 2011. Archived from the original on 8 August 2014. ^ a b "Declan Donnelly left devastated by the death of his father". Daily Mail. 25 August 2011. ^ a b c Jones, David (August 2013). "Declan Donnelly: TV presenter and brother of a Catholic priest". Catholic Life. pp. 62–64. ^ a b "Ant and Dec are laughing all the way to the bank". Daily Mail. 10 April 2007. ^ a b "The boys next door". The Guardian. 10 September 2005. ^ Gallagher, William (12 May 2002). "Ant and Dec's likeable lads". BBC News. Retrieved 22 March 2018. ^ "Declan Donnelly engaged to Ali Astall". Raidió Teilifís Éireann. 13 November 2014. Archived from the original on 13 November 2014. ^ "Declan Donnelly marries agent Ali Astall in Newcastle". BBC News. 1 August 2015. ^ "Declan Donnelly and wife Ali Astall welcome baby girl". BBC News. 1 September 2018. Retrieved 8 September 2018. ^ "Ant and Dec: just the two of us". The Guardian. 23 February 2013. ^ "Cathedral Life — Clergy and Staff: Father Dermott Donnelly". stmaryscathedral.org.uk. Archived from the original on 11 August 2014. ^ "Youth Village Opening". ymt.org. July 2010. Archived from the original on 11 August 2014. ^ Gibson, Owen (18 April 2007). "Kings of Saturday night TV scoop £30m jackpot". The Guardian. Retrieved 25 March 2011. ^ "No. 61608". The London Gazette (Supplement). 11 June 2016. p. B13. 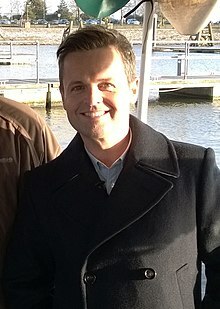 Wikimedia Commons has media related to Declan Donnelly.